People say that the way to a man's heart is through his stomach, but women love to eat too. The Internet has made it easier than ever to connect with amateur chefs and share fantastic recipes through the growing number and variety of social networks available. Whether you're looking for a new dish to try or you want to share your experiences with your fellow cooking enthusiasts, there's a social network for you. Engage with your fellow culinary enthusiasts from all around the world with these cooking, recipe and food-oriented social networks. Despite what its name may lead you to believe, BakeSpace isn't just about baking. It is a grassroots cooking website with over 50,000 member-submitted recipes, including thousands of baking recipes. While you do not need to register with the site to browse through the library of recipes, you will need to have your own account if you would like to publish your own recipes, build and market your own digital cookbook, or participate in the kitchen mentorship program either as a mentor or a mentee. The individual recipe pages do not offer a rating or review system, but you can click through to see the user's individual recipe box or share the recipe through other social media platforms. 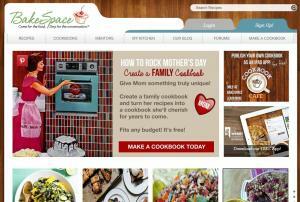 You can also participate in discussions through the BakeSpace forums. Cucumbertown describes itself as "a closely knit tribe curating recipes from the world over." Many of the recipes posted by Cucumbertown members are available for viewing by non-members, but you will need to register to have access to the full library. You will also need an account if you wish to "follow" other cooks on the site. Registered users get their own profile page and the ability to publish as many recipes as they'd like. After you have submitted a "sufficient" portfolio of recipes, you may be invited to have your own personalized username.cucumbertown.com domain for your own sub-website. On the individual recipe pages, users can like, comment ("notes"), and provide a star rating up to five stars. If you've tried a recipe, you are encouraged to upload a photo of the dish too. Users can choose to sign up for Cucumbertown using an email address, Facebook account or Google account. 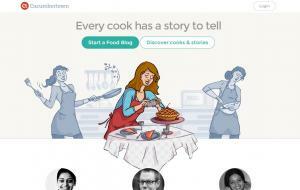 The site design for FoodPals may look comparatively dated next to more modern social networks, but the community aspect is strong on this cooking and food-oriented social network. Non-members are free to browse through over 18,000 recipes and over 600 blogs, but registration is required to post anything of your own. Individual recipe pages allow for comments, reviews, and ratings up to five stars. There are multiple social and sharing aspects to FoodPals that help develop this sense of online community. Members can add recipes to the FoodPals global network, and they can also post their own blogs via their free webpage. This is also where they can share a photo gallery, a virtual cookbook and a guest book. Members are encouraged to participate in the discussion forums, upload videos, and join groups on the site as well. The goal of NibbleDish is to create an online cookbook with the "best user-rated recipes" to inspire your next meal, dessert or snack. 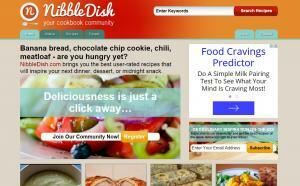 An online community of avid cooks, NibbleDish community members create basic profiles where all of their submitted recipes can be gathered and shared. The 7,000+ recipes are publicly accessible and can be searched for based on ratings, tags, and popularity, and the food photography is top notch. Recipe pages encourage user feedback in the form of comments, and the social sharing links are found along the bottom of the screen. What's handy is that the ingredient list is shown along the right side of the recipe with the instructions along the left side, which makes it easy to refer to both at the same time. Recipes can also be embedded on your own website using the embed code provided. The most active members can earn "Pro" status with a clear designation on their profile pictures. While there is certainly a social aspect to the online community of Recipefy, the website is designed to help cooks better manage their recipes by organizing them by tags. These recipes can then be shared easily with friends by email, Facebook or Twitter. Recipes can be set to public or private, in case you have a secret recipe you'd rather not share with the world at large. Of course, connecting with other cooks and exploring their recipes is equally important. You can comment on and "like" recipes, the latter of which is akin to bookmarking the recipe for later use. If you find another cook that you particularly like, you can also "follow" him or her to get updates about new recipes. 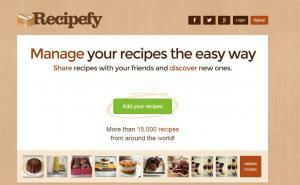 Recipefy boasts over 15,000 recipes from around the world, and they can easily be explored based on category or country. You can also search for recipes based on keyword. Tap into the culinary wisdom of your fellow amateur home cooks, as well as any professional or semi-professional chefs who participate in these wonderful cooking social networks. You'll find the sheer variety of recipes and cuisine is truly astounding. Browsing through additional profiles and boards related to recipes and cooking, like Pinterest, will really expand your recipe collection.